When/where did I read this book? I listened to the audio book version of this book while commuting to work an hour each way. Since the audiobook is about eleven hours long, it took me about a week. Why did I read this book? I’ve always been interested in Abigail Adams, but it can be tricky to find whole books written about women in history like that. 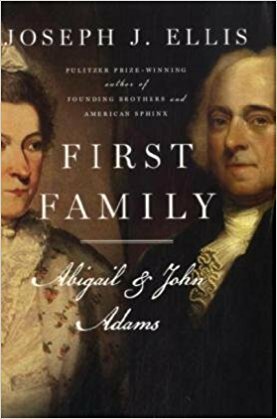 When I saw that Ellis–one of my favorite historians–had written a book about the Adams marriage, I knew that I had to read it! + Focuses on Abigail. This book almost feels as though it focuses more on Abigail than on John, perhaps because she tended to write longer, more emotional letters whereas his were often just quick notes. Whatever the reason, I really liked the focus on Abigail! + Presents a Founding Father as a flawed person. I completely would have guessed that this book was written by a woman if I hadn’t known who the author was ahead before reading. It seems quiet biased against John, pointing out all the ways he prioritized fame, status, and political prestige over his duties as a husband and father. For instance, he went on and on about politics in a series of letters at one point, completely neglecting to ask how Abigail was doing as she gave birth to a dead child while he was away. I love how this book helps deconstruct our vision of the Founding Fathers as these heroic, flawless, moral gods that could do no wrong. + Spotlight on a marriage. At its core, this book revolves around the marriage between John and Abigail. Not many books focus on historical marriages, especially in the balanced, nuanced, thoughtful way that Ellis does in First Family. Before reading this book I had no idea that John and Abigail spent so much time apart–it’s remarkable that they were able to hold their marriage together throughout their entire lives. + Quotes. I’m a sucker for a good meaningful quote, and this book is brimming with them. In particular, I love Abigail’s words: “When he is wounded, I bleed” and “A woman may forgive the man she loves an indiscretion, but never a neglect.” Nothing better than a good quote! Questions of subjectivity and credibility. It’s no secret that the reach of historians only extends so far. While dates and names can often be surmised from old belongings, newspapers, and letters, there’s one aspect of the past that historians will never be able to fully uncover: people’s innermost thoughts and emotions. One may point to a diary entry or personal letter written to a loved one as evidence of this inner dialogue, yet even those kinds of documents cannot always be trusted as being completely accurate. Ellis even describes this problem in First Family, pointing out the performance aspect of the letters Abigail and John wrote back and forth to each other while John was overseas on diplomatic duties. Apparently John insisted that Abigail make a copy of all of the letters she sent him in order to keep a record for posterity. John did the same–he was acutely aware that they were part of an important moment in American history that would be looked back on for years to come. With this in mind, I found it a bit hypocritical that Ellis clearly relied on such subjective, posing documents in order to create such a detailed account of this marriage. I suppose that an aspect of history is making educated guesses, and so long as they are recognized as such up front I’m okay with it. However, at times it was difficult to distinguish hard fact from Ellis’ subjective best guesses. A clearer distinction between the two would have made this an even more powerful, striking read. Joseph J. Ellis has a way of making frequently idealized historical figures feel so human, and his portrayal of John and Abigail Adams here is no exception. I would highly recommend this book (and the audio book version!) to anyone looking to learn more about Abigail Adams and her marriage with John. Without her, I would argue that John would never have become the successful man he was. < Previous Top Ten Tuesday: Books I Meant to Read in 2018 (But Didn’t) | Bookstagram Edition! Ill have to check out this book. I Loved the HBO series John ADams and the book it is based upon. It was also a long read, but what an incredibly modern pair they were! From their disapproval of slavery, to her feminist stances (dont forget the ladies!) to their use of immunization before it was fashionable or even considered particularly safe…and the HBO series definitely shows the self-conscious, egotistic yet unloved and underappreciated side of John Adams character. He wore the mantle of greatness, but it never fit quite right!